There are some great strengths in this book, and some great weaknesses--in my opinion. The biggest thing that drove me crazy was the author's extensive reliance on literary sources. I hadn't read any of the books she was referring to and thus those references made no sense to me. Her reference list at the end is super long, and most of them aren't scholarly research articles. They're novels, poems, etc. that she quotes in support of her arguments. Only, I can't tell how well the passages show her argument because they're out of context for me.That said, she does makes perceptive statements about the nature of education, the arts and social change. (It's fairly clear where she stands in politics, which is a little annoying. I think you can be a good teacher whether you lean one way or the other.) The first three chapters/essays in particular were really thought-provoking.Overall, I think it was worth my time to read this, but I wish I'd been familiar with the literary sources she constantly quotes and discusses. I feel like I missed a big piece of the picture. Maxine Greene is a true visionary in the highest sense. Her essays contained in Releasing the Imagination encourage the reader to think outside the box, to challenge their own ideas, and furthermore to become the teacher that truly changes the lives of her students. I am inspired by Greene and encourage anyone who wants to think in a new way to read her. Students didn't like this book as much as I did when I taught it this summer. Theory interspersed with literature, poetry, fictional characters, musings about art, and the importance of aesthetic experiences in education. A worthwhile book. To say that I "read" this is a lie. I skimmed most of it. It was painful. After 200 pages, the message is this: use your imagination. DUH!!!!!!!!!!!!!!!!!! What a waste of time. 'As we ponder educational purposes, we might take into account the possibility that the main point of education (in the context of a lived life) is to enable a human being to become increasingly mindful with regard to his or her lived situation - and its untapped possibilities' (p. 182). Reading this and another Maxine Greene book during my graduate work in education almost sent me away from education. I agree with so much that she says and feel so helpless in the machine. I may revisit this reading someday. 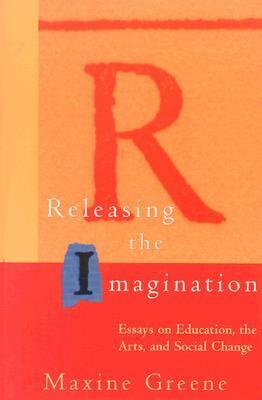 A classic book for arts-education which borrows from phenomenological philosophy & heralds the arts as a vehicle for social change in education.